This March, NASA’s Dawn spacecraft became the first explorer to visit a dwarf planet. Primarily a science mission, Dawn will map the surface of the asteroid belt’s largest citizen, Ceres, to learn more about what the early solar system was like. And now you can visit Ceres too—NASA recently stitched together 80 images of the dwarf planet into a 3D video tour of the surface. Ceres accounts for 25% of the mass of the asteroid belt, and unlike most of its irregularly shaped neighbors, it is massive enough to be nearly spherical like a moon or planet. Scientists believe it may provide a good indication of what a rocky planet like Earth may have looked like as it formed early in the solar system’s history. To provide a more complete picture of Ceres, Dawn will measure its mass, shape, volume, and spin and also research mineral composition and internal structure. Models of the dwarf planet’s interior suggest its mantle may consist of a slurry of water and dirt that contains more fresh water than Earth. 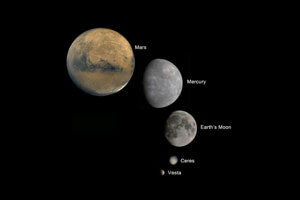 Ceres, second from bottom, shown to scale. Indeed, early images from the Dawn mission showed mysterious bright spots on the surface. We won’t know what those bright spots are until Dawn swoops lower and resolves more details, but highly reflective patches of surface ice are one possibility. Discovering water on Ceres would have implications for space exploration. Water is a potential source of hydration, breathable air, and rocket fuel, and will therefore prove a precious resource for space wanderers. For that reason, some have proposed Ceres would make a good extraterrestrial outpost. Its low gravity makes landing and taking off less energy intensive, and resources on the surface could resupply missions—perhaps even trips to the outer solar system. For now, it’s a beautifully alien place to visit in videos, but the data collected by the Dawn mission could drive future missions, robotic or human, back to the dwarf planet.